In recent years, there has been more and more news about certain symbolic images or messages found in currencies all over the world. Whether this means there is an increasing number of common folks that might take their hobby to the extreme. Or that some people are finally aware of a secret world order, it is up to you to decide. 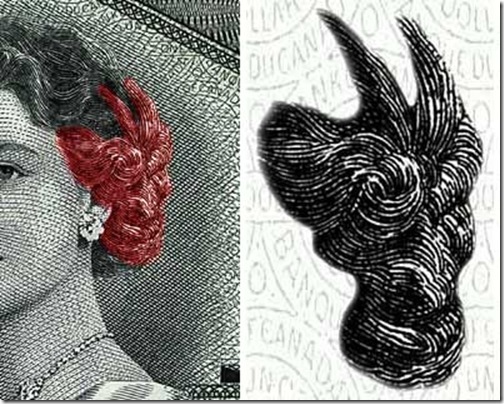 Here are some of the most shocking images you can find on your money, if you look carefully and closely enough. This year, June 30 was the last day when the old Britain’s £20 banknotes, featuring the composer Edward Edgar, were legally in circulation. 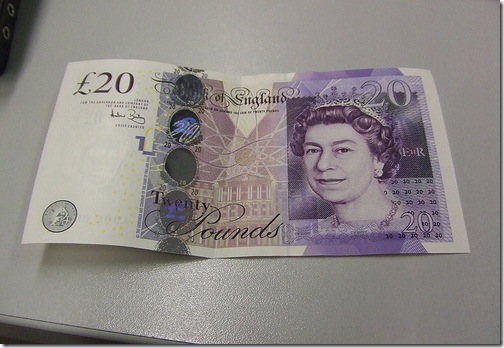 From that day on, new notes displaying the economist Adam Smith and The Queen Elizabeth II were the only ones to be accepted in Britain. 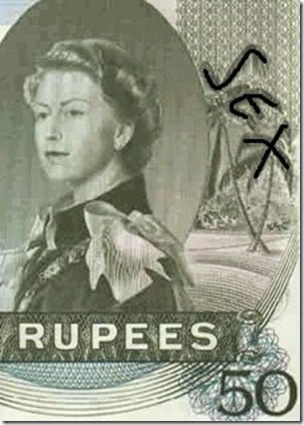 But the Queen’s portrait is not the only remarkable image on the new note. In the very center of the note, there is a rose surrounded by lines merging into each other. Right beneath this detail, you can see the image of The Bank of England. By outlining different lines in this area, you can notice a whole set of geometrical figures, depicting many doubtful symbols: the pagan and satanic stars, as well as the Star of David. Put all of these findings together and you will uncover the Illuminati pyramid. 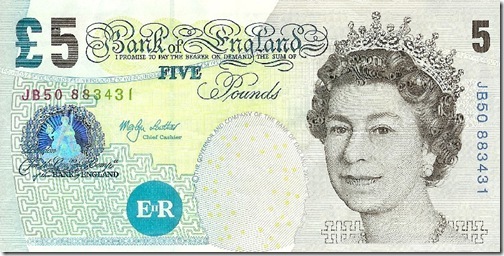 Moreover, the rose and the set of stars might represent the Eye of Providence (or the “All seeing eye”) that tops the pyramid and, metaphorically, The Bank of England. There are some conspiracies that mention the existence of a different kind of species, called reptilian or simians. They are considered to be far more intelligent than any human being, living hundreds of miles underground, feeding off negative energy. Supposedly, they manipulate all humankind through technology and money, which are supposed to create the highest amount of negative energy. As a sign of their presence, some Brits have discovered a tiny hint on the £5 note. Whether it is the face of a reptile or a reptilian, this is still a matter of debate for the skeptics and the world order conspiracy believers. The magnified image is indeed interesting and some eyes might see a physiognomy in these details. The small republic of Seychelles comprises 115 little islands in the Indian Ocean, making it the tiniest African state. The inhabitants are a mixture of Asians, Africans and Europeans, since the latter (especially the British and the French) ruled the islands for hundreds of years. Seychelles gained its independence from the United Kingdom in 1976, when it adopted the Seychellois Rupee as its currency. 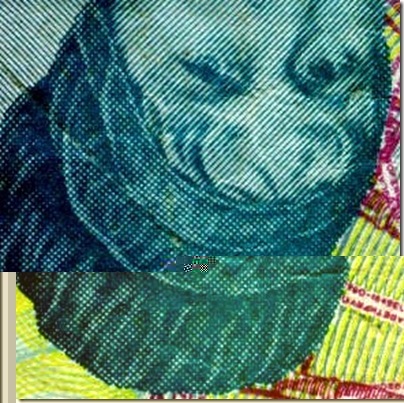 The image above represents one of the first editions of the 50 rupees bill, issued right in the year of their independence. Although the note lacks any Illuminati or reptilian details as some of their ex-sovereign bills might have. The palm leaves on the right side of the note might capture your attention. 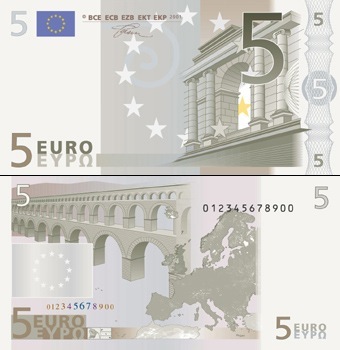 The focus here is the aqueduct on the back of the note. Symbolizing a bridge between two different banks, this represents a connection between the human condition and the spiritual state. Making the Euro seem a currency meant to become a World Axis. Connecting an undefined territory with the actual map of Europe, the image suggests a long way to go in order to achieve unity and harmony. The symbol of a bridge, along with the arches, arcades, pillars and columns are common concepts for the Buddhist religions. They suggest transformations and a road with a mighty destination, yet with a tragic faith in case of return or a backward look. Moreover, these semiotics understandings can be applied to the currency symbol, as well. The arch crossed by the two horizontal lines suggests a cyclic path around a destiny, a World Axis. Is it Elizabeth or the Devil? The death of King George VI, in 1952, allowed his daughter, Elizabeth, to succeed him on the throne of United Kingdom. As a consequence, the Commonwealth countries had to manifest their support by displaying images of the new monarch on their currency. This is exactly what happened in Canada, in 1954, when the new 5 Dollars banknotes were issued by the National Bank. 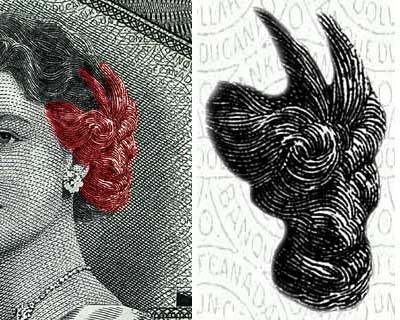 But instead of admiring the new Queen of England on the note, Canadians were shocked to see a sinister resemblance to the prince of darkness. It was the hidden image of the devil in Elizabeth’s hair that lead to this general impression. The Queen’s portrait is said to have been draw by a French Canadian artist that despised the English, while an official explanation of the incident was never offered. Two years after, the National Bank of Canada resigned the whole banknote. If there is one country in the world where the stories and theories about conspiracies are indisputably linked to the currency, this is without doubt United States of America. There are plenty of theories about hidden symbols that span to US coins and banknotes, related or not to historical events. The most contested was and continues to be the 1 Dollar bill. 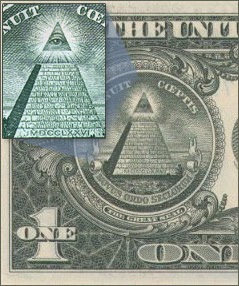 It is said that the all-seeing eye above the uncapped pyramid on the back of the banknote is a Freemasons symbol, suggesting that society is secretly manipulated by an exclusive and secret group of people. Others say that the eye represents the control that the Government has upon the masses. Some even consider that the similarity of this detail to CBS or America Online’s logos is part of a secret pact between the Government and the big corporations to keep tabs on citizen. 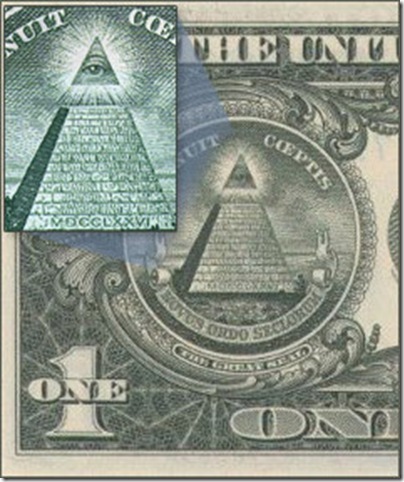 Moreover, on the base of the pyramid the Roman numeral for 1776 is shown – that is the founding year of Illuminati – and the inscription “NOVUS ORDO SECLORUM” beneath meaning “the new secular order”. Another Illuminati detail is the presence of the Triforce on the front of the bill. This represents a sacred relic used by the mason, made up of three smaller triangles: The Triangle of Wisdom, The Triangle of Power and The Triangle of Courage. 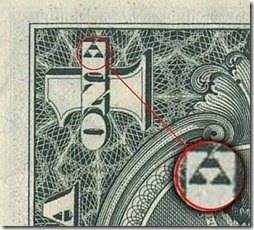 Also, next time you’ll handle a 1 Dollar bill, see if you notice some not so well hidden animals. On the front side, right corner of the banknote, very near the top left numeral one, you will see a tiny owl. Some say this represents the bohemian society trying to control the masses. 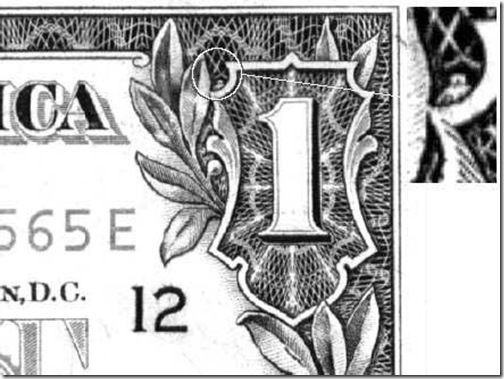 Others think that the owl is used as a warning for all the other hidden symbols on the bill. 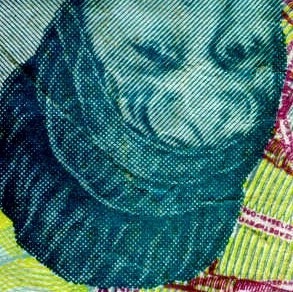 Christians suppose that this owl is a remnant of the Devil that expresses Satanic understanding throughout currency. 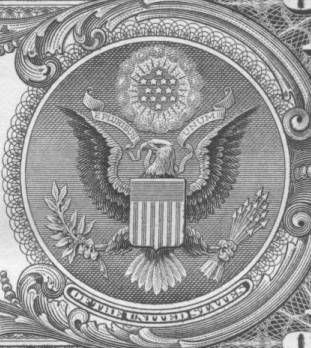 The last but not least symbol is the Great Seal of United States, also considered an Illuminati sign. 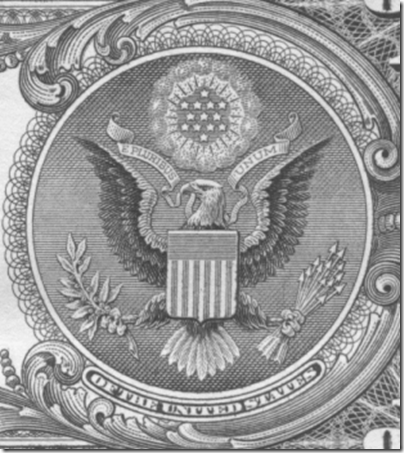 The nine feathers beneath the eagle are said to represent the nine spheres returning to heaven, while right wing’s thirty-two feathers being the number of ordinary degrees in the Scottish Rite Freemasonry. The eagle holds thirteen arrows, an olive branch with thirteen leaves and thirteen stars that shine upon the eagle. This might suggest the number of the original colonies, but some say it might be a secret code. While the stars on the bill are arranged as a Star of David. 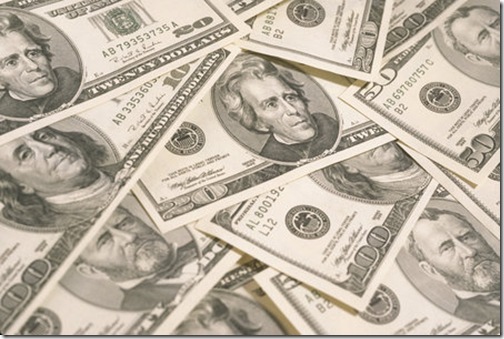 The 9/11 series – since when on the US currency? 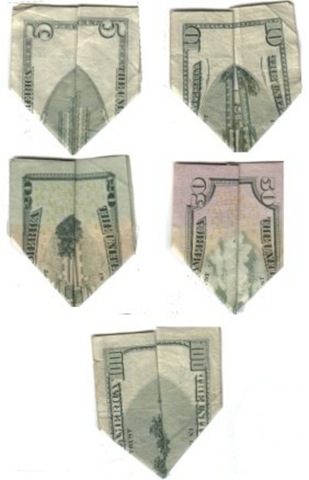 It is believed that the 9/11 images on the US currency were printed as a warning for the Americans or as an inspiration for terrorists. 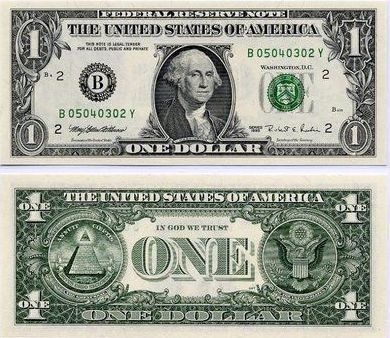 Other people relate these images to the symbols on the one Dollar bill, as a prophecy of a New World Order. No one (except their presumed creators) will know for sure what these signs really represent. But take one of each of the following bills: 5$, $10, 20$, $50 and $100. Make sure you follow the next process for every single bill and that you keep them in the order above. 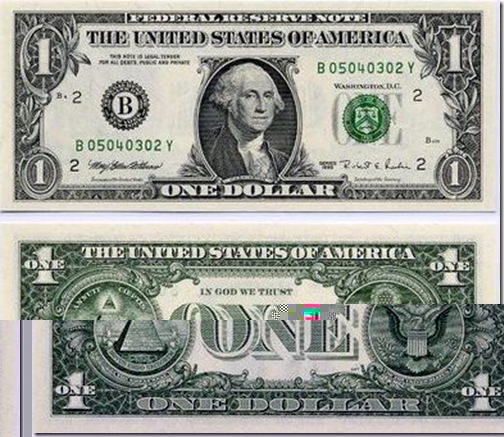 As you watch the front of the note you flip and fold it vertically, then you fold the left side of the bill (approximately one third) up into an L shape and then you do the last step again, for the right side. You will get the five episodes of the 9/11 tragedy. The intact Twin Towers, the Towers with one building hit, the Towers – both hit, the Towers – starting falling, the Towers – almost demolished. 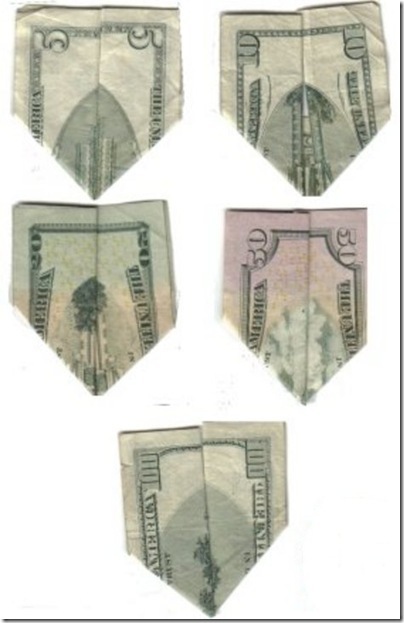 For the story of the Pentagon, flip over the bills. Interesting enough?